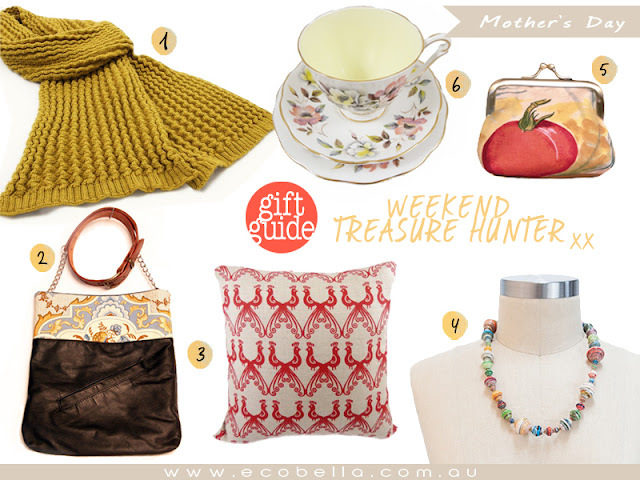 Is your Mum a weekend treasure hunter & collector (and shopper), scouring the local markets & boutiques for crafty finds? Picking the cream of the crop at the farmers market for a hearty meal. And finally relaxing with good friends and a cup of tea in the afternoon? Here are some perfect finds for your eclectic collector Mum. 1) Katie Scarf by Uimi $79 - A wonderful wooly scarf to keep Mum warm on cold market mornings. 2) Leather Satchel by Lydra $165 - A one-off, practical handmade tote from repurposed fabrics and leathers. 3) Peacock Party Cushion Cover by Thea & Sami $89 - A folksy print on natural linen, by a talented local designer. 4) Jubilee Necklace by 31 Bits $28.95 - A statement piece in recycled paper by empowered Ugandan women. 5) Coin Purse by Lydra $54 - A fun place to stash market cash, in vintage fabrics. 6) Vintage Queen Anne Tea Cup a vintage find $45 - to add to her crazy tea cup collection.